At the junction of two remarkable ecosystems that are the Rhône delta and the stony desert-like Crau, the Vigueirat Marshes is a mosaic of natural wetlands characteristic of the Camargue. Preserve natural site of 1200 hectares, there are more than 2 000 plant and animal species, and it is necessary to protect them throughout the year. 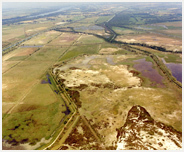 A management plan developed from the assessment of the natural heritage of the site, to determine the main management goal of the Vigueirat Marshes. to manage and develop our economic entreprises on-site and to develop good relationships with the local area.